Great Location in the Heart of Columbia! Presenting: our true Southern Belle with modern sensibilities. This lovely home is making her official debut appearance to the HomeAway/VRBO family. 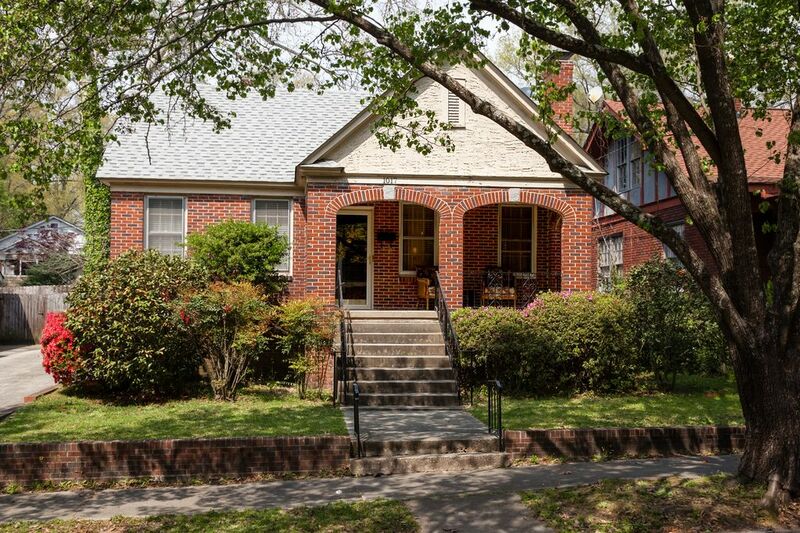 We cordially invite you to stay at this beautiful brick bungalow in the heart of the historic Elmwood Park neighborhood, in Columbia, SC. This home has been lovingly restored, keeping many of the original finer details, such as the newly refinished hardwood floors, curved archways, transom windows, large farmer's sink, and shaker style cabinets in the Butler's pantry and kitchen. There have been many updates that will bring you all the modern conveniences, as well as the technology necessary for the business professional, and recreational user. The house is fully furnished, and stocked for your weekend getaway, family vacation, and frequent business traveler. The central location of this house is close to everything wonderful that Columbia has to offer, including the Williams-Brice Stadium, home of the USC Gamecocks, the Columbia Fireflies baseball stadium, The Vista, Five Points, the Riverbanks Zoo and Gardens, and many more fun activities. The Congaree, Saluda and Broad Rivers offer opportunities for natural outdoor activities such as hiking, biking and kayaking. Lake Murray is 17 miles from the house. Fort Jackson is a quick 28 minute drive from the house. The food scene in Columbia is terrific, and the variety of restaurants rivals that of many, much larger cities, while still maintaining that wonderful southern flavor. The house is located in a quiet, residential neighborhood, yet is very close to the major highways for an easy commute. We believe that this home is the best one in Columbia for all your traveling needs, and look forward to booking with you soon. My husband and I have traveled all over the world and have had our share of experiences living in hotels. It didn't take long for us to realize, that even in the nicest hotels, it just wasn't as comfortable as our own home. We have worked very hard to make sure your stay will have all of the comforts of home. Location location location. Our home away home is located in central Columbia. minutes from Firefly Stadium, USC, downtown, Gervais St, 5 points and the expressway. We share a driveway with our neighbor. There is room enough for their car and yours. Also, there is plenty of free on street parking. Instead of satellite/cable, we have a smart tv Roku, Netflix, local channels, Hulu, Amazon Premium, Pandora and many more options for your viewing pleasure. Located in the bedroom closet with the double bed, there is a Pack & Play crib for your little ones. We had a nice two night stay in this home. Plenty of space for 4 persons, two being teens. This home is super close to fun restaurants, USC campus, zoo, and river walk park. Just as described. We loved staying at this place. Five adults comfortably stayed in the house. I especially appreciated having two king-sized beds. The owners were quick to reply to any questions I had. The location was very convenient to downtown Columbia. I would definitely stay there again. Great location...convenient to our venue at the roller derby tournament at the armory. House was roomy and very comfortable. Enjoyed our stay. Enjoyed my stay. Cathy and Rob are wonderful people. Always available to help if they could. The house has all the amenities of home with great internet and satellite service for the tv. It was nice to be able to go back there after a long days work and just relax. I was able to walk to the museum downtown (1 mile) and there are some good restaurants there as well. It is a. central location but is in a good quiet neighborhood. Lovely house, clean, nice furnishings and very comfortable beds. Located in a great area near downtown with easy access to the interstates. Quiet neighborhood.